We consecrate a separate page to this crime because it is key to two of our objectives : prosecute also those who were indirectly responsible for the genocidal massacre in Syria and to induce a society debate about this subject. 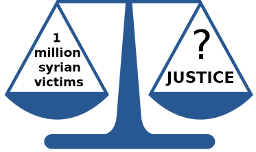 So what does “crime of omission” in International Humanitarian Law mean ? Pretty much the same as in ordinary criminal law : the failure to act knowing that this failure would cause the crime to happen. And those accused of the crime of omission, could be prosecuted for possible complicity to crimes against humanity. Now let’s apply this to what happened in Syria in recent years, and investigate in how far for these reasons European, and eventually American leaders, possibly may be considered complicit to crimes against humanity. 1. The accused must have had a legal duty to act : check ! The Geneva Conventions, which were ratified by most European countries, Russia and partly by the United States, require that States do all in their power to repress grave breaches of International Humanitarian Law. The failure of international organizations like the United Nations or the European Union to act, does not exempt the individual countries from these obligations. 2. The accused must have had the ability to act : check ! European and American leaders had absolutely the ability to use those tools. 3. the accused must have had an elevated degree of concrete influence : check ! As a matter of fact, Assad’s war machine, and thus the crimes against humanity committed by it, was largely, though indirectly, financed with European money. Through it’s oil-and gas trade with Russia, untouched by the sanctions imposed in the wake of the Crimean occupation by Putin’s special forces, Europe finances approximately 35 % of the Russian federal budget. Without this money, or even with only part of this money, it is unimaginable how Putin could have kept on financing and arming the Assad regime. And as all international observers agree, Putin’s support was key to the continuation of the armed conflict. Europe had with other words, like no other power, through its oil and gas trade with Russia, truly the greatest degree of potential concrete influence on the Syrian armed conflict. The economic ties between the US and Russia are dwarfed by the European ones, so US’ possibilities to exercise economic pressure by means of economic sanctions were much lesser. From the other side through its outstanding diplomatic and economic position as a world power, the US has other peaceful means to exercise pressure. 4. the accused failed to act, (…)with awareness and consent that the consequences would occur : check ! “Failed to act” pertains not only to the question if there were any measures taken at all. It also pertains to the question if those measures were commensurate to the graveness of the breaches and taken in a timely manner. Unfortunately, the US and Europe simply refused to live up to their obligations that arise from the signed and ratified treaties. They did not order their courts to investigate the grave breaches and they only imposed sanctions on the weakest party to the conflict, the Assad regime, and spared mostly those arming, financing and participating in those crimes : Russia and Iran. They did this in full “awareness” of the consequences. Since 2013, year by year in their annual reports, international organizations and human rights organizations have been blaming the international community’s failure to act as the main cause of the perceived feeling of impunity that seemed to inflame the cruelties in Syria. The element of “consent” can be derived from diplomatic custom. In diplomacy, sticking to appeals during years in the face of repeated crimes against humanity, equals to a blank check for the perpetrators. 5. the failure to act resulted in the commission of the crime : check ! The refusal to take appropriate measures against the main parties to the conflict, Russia and Iran, led to a sense of impunity and inflamed the cruelties. That became very obvious from September 2015 onwards, when Putin decided to engage his army more. It heralded an unprecedented intensity in air bombardments and crimes against humanity committed in their wake. Especially the months August and September of 2016 were particularly brutal. Observers described the committed acts as “worse than a butchery”, “a bloodbath”, “barbaric”, “abomination”, “spit in the face of international humanitarian law”. On October 17, 2016 the European Secretaries of State and Ministers of Foreign Affairs had a meeting to discuss European foreign policy. Since there was no doubt about the direct Russian involvement, and some politicians had declared in interviews that they were considering sanctions against Russia, many observers expected that finally sanctions might be taken. But none of that happened. Not one European member state had officially introduced a request of that kind. The US as well did not take any additional and appropriate measures. Since what had happened before was already “unbearable”, everybody knew that what was going to come was going to be “hell”. On November 15,2016 after a three weeks lull, started the worst air bombing campaign and breaches of international humanitarian law the Eurasian region has witnessed since the Second World War : the attack on East-Aleppo. Can there be any clearer link ? We can conclude that many elements point into the direction that European as well as American leaders, confronted with the genocidal massacre in Syria, of which they were regularly informed, intentionally failed to act knowing that this failure would lead to the relevant crimes. Doing so, they sinned against the principles of humanity out of which international humanitarian law has grown and might be complicit to those crimes for reason of criminal omission.